This is one to check off the list. 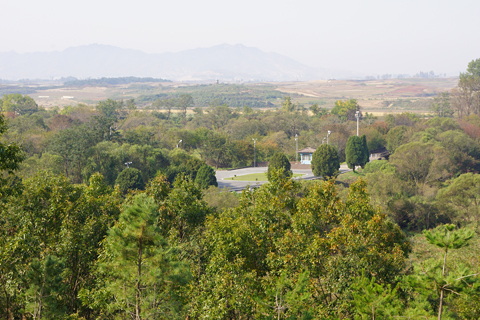 The Korean Demilitarized Zone (DMZ) is a four kilometre wide strip of land running roughly along the 38th parallel. This area serves as a buffer zone between North and South Korea, with each country caring for the two kilometres of land lying on their side of the Military Demarcation Line (MDL). Measuring 250 kilometres from east to west through the Korean Peninsula, it is officially the most heavily militarised border in the world. Even though the war effectively ended in 1953 with the Korean Armistice Agreement, peace between the two neighbours remains a long way off. Unsurprisingly, such a unique destination tops most recommendation lists for visitors to South Korea. Despite its serious nature it is surprisingly easy to book a tour, assuming you carry the right passport. 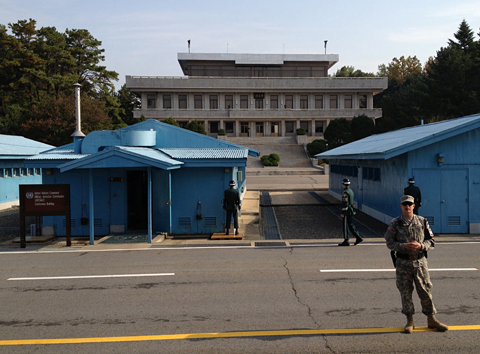 From the Camp Kim USO office in Seoul it took us just over an hour by bus to reach the outskirts of the DMZ. There we were met by two playful American soldiers who would be our guides for the morning. At Camp Bonifas, in the Joint Security Area (JSA), we took in a very clear and informative history lesson. The JSA, located in the abandoned village of Panmunjom, is a blue battleground where staring matches are fought between northern and southern soldiers on a daily basis. It also has the honor of hosting very occasional diplomatic negotiations. As we were escorted outside, just metres away from the MDL, we were instructed not to make any gestures or attempt to call out to any North Korean military personnel we may see. In the end we saw only one, a uniformed figure who observed us silently from a distance. Supposedly he had backup hiding in the building behind him. The North Korean soldiers only come down to take a closer look if the tour group appears to be of particular interest. It turns out that we were neither rich nor female enough to warrant their attention. After a photo opportunity everyone packed into the small MAC Conference Room. This is where, like it were no big deal, we stepped across the border and onto North Korean territory. The unwavering posture of the aviator-wearing South Korean soldiers reassured us of our safety. Until 1976 North and South Korean personnel were permitted to move freely on either side of the MDL, provided they stayed within the JSA and carried no weapons. This privilege was revoked following the aptly titled 'axe murder incident', which involved the brutal killing of two United States Army officers. They were planning to trim an obtrusive tree, with the feigned approval of the North Koreans. Needless to say it all went horribly wrong. The tree was eventually cut down three days later in a gigantic operation that cost millions. We were able to grab a view of the monument that sits where the tree once stood, right near the inconspicuous Bridge of No Return, which crosses the MDL. It is a pity we did not get a better look around this spot, as it is one of the eerier points of interest in the JSA. A bit further up the hill at Observation Post 5 we spent some time surveying the mostly empty northern half of the DMZ. The southern side is lush with trees and bush, while its opposite is almost entirely bare. Trees or not, it would be hard to miss the 160 metre high flag pole that rises out of North Korea's uninhabited Peace Village. To the rest of the world this facade is better known as Propaganda Village. Since the armistice North Korea has made at least four attempts to tunnel south, with the presumed intention of launching a surprise attack on Seoul. The Third Tunnel of Aggression, which we had the opportunity to walk along, was discovered in 1978, based on a tip from a defector. North Korea initially denied responsibility for the tunnel, and then declared that it was simply part of an innocent coal mine that lost its way. Retreating soldiers were ordered to paint the walls of the granite tunnel coal black to strengthen the illusion. 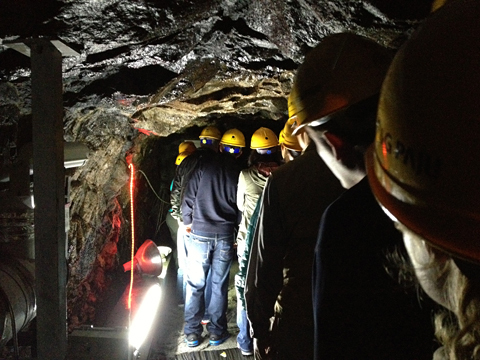 The southern end of the tunnel emerges just 44 kilometres from Seoul, and has a constant stream of civilians descending the 73 metres below ground to take a look. This involves a lot of hunching for those cursed with being taller than 5'4". For the disinterested-looking school children that passed us by, the low ceiling was not a problem. One boy was even playing with his Nintendo DS as his class marched single file down the damp passage. We made it back to the surface and headed straight to Dora Observatory, the northernmost point in South Korea. With the assistance of binoculars this is the best place to get a wide, high up view of the DMZ. From here we laid our eyes on part of the Kaesong Industrial Region, which houses collaborative manufacturing facilities that provide employment to any and all Koreans willing to make the risky commute. The vista was spectacular, but unfortunately photography is strictly prohibited. 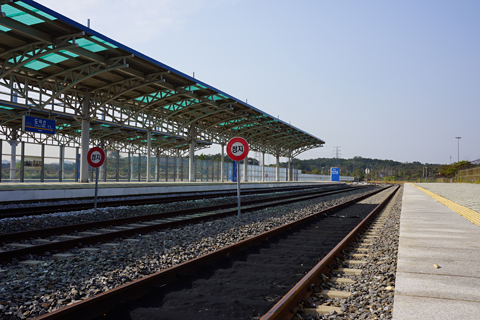 Our final stop on the tour was at Dorasan Station. A peculiar place, it waits in limbo, kept lightly staffed in hopes that one day North Korea will allow the railroad to reopen on their end. This would not only help to reunite the countries, but also give South Koreans a route to access Europe by land. Right now it is a curiosity for tourists, who are able to purchase fake tickets and mosey out to the platform. There the tracks sit quietly, waiting for a train that may never come. You can check out a few more photos here. One of the longest public holidays on the Korean calendar is Chuseok. Taking place in the middle of Autumn, Chuseok is, or at least traditionally was, a three day harvest festival. For Koreans this break is often spent with family, visiting hometowns, eating songpyeon (a kind of rice cake), and paying their respects to ancestral spirits. As we both lack a Korean family this left us free to vacation for the five day weekend. It comes as no surprise that this period is also the worst time of the year for traffic congestion. Aiming to avoid this nuisance, a lot of foreigners flee overseas. We decided to ignore this wisdom and instead headed straight for Seoul, which turned out to be as empty as it ever gets, although still quite crowded by our standards. In the end not a minute of our holiday was lost to traffic, and we even made it up to the capital city in record time. Seoul is a convenient place to stay as it provides numerous options for travelling to nearby cities and provinces. It is also home to a wealth of great places to shop and eat, a luxury we took advantage of as often as possible during our stay. We picked a hotel within walking distance of the bus terminal in Gangnam and by noon on Saturday were set up to visit several of the best sights Korea has to offer. The weather was perfect too, just as it was promised to be during this most photogenic of seasons. 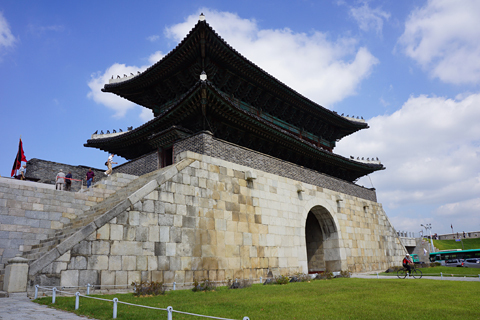 Early on Sunday we departed for Suwon, the capital city of Gyeonggi Province. Sitting at the end of a Seoul metro line, this is a quick and easy destination to hit. We were surprised to find the streets a complete mess upon our arrival. We must have missed quite the party. That was fine though, as we were in town to explore the World Heritage listed Hwaseong Fortress. This nearly six kilometre long wall surrounds the city centre, ascending and descending hills as it links up four gigantic entrance gates. In the crisp morning air we enjoyed a pleasant bit of exercise walking around the wall. Not long before lunch we marched inward to reach Haenggung Palace, where we discovered a cultural festival in full swing. It was a charming scene, even in the blinding midday sun. For Monday's excursion we had booked our bus tickets well in advance. This cautious planning proved necessary, as the return trip from Sokcho was sold out until the next day. 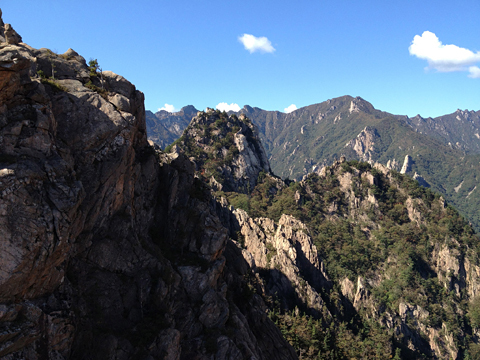 Sokcho is a city that rests on the eastern side of Korea in Gangwon Province. It has a nice beach, a small town vibe, and a lot of fishing going on. It is a popular stop for tourists due to its proximity to Seoraksan National Park, one of the most picturesque nature reserves and mountain ranges in the country. Predictably, that is why we were there, along with a few thousand others. It really didn't seem that busy until we made it into the queue to buy tickets for the aerial cable car, which would take us a kilometre upwards for a serious view of, well, everything the eye could see. The wait ended up being around an hour, as we were early enough to beat the real rush. The ascent was exciting and the view breathtaking. This would also provide our first, but not last, holiday interaction with squirrels. Photos do not do justice to the pristine beauty of this area, far removed from the crowded cities that most of the population resides in. With plenty of time to fill before our late bus back to Seoul we bumbled south to Naksan Temple. Apart from the pathway of spiders, this was a tranquil place to visit, with everything we have come to find familiar about Buddhist temples. There was also the bonus attraction of a great view out over the Sea of Japan. 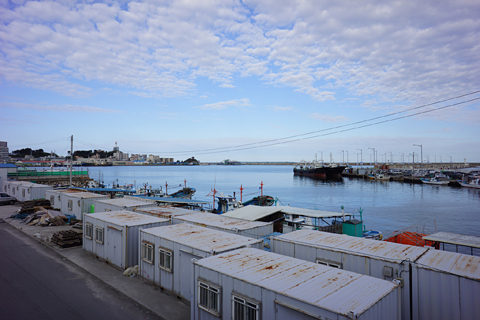 As the sun was beginning to set we found ourselves back in Sokcho, walking along the waterfront. This unplanned detour turned out to be one of the nicest moments of our Chuseok weekend, and even reminded us a little of home, save for the absence of wind. And so we ended the longest day of our break, strolling through a sleepy part of this quaint city as the last golden rays spread out across Cheongcho lake. Unfortunately for our tired bodies we had a plan for Tuesday and it involved getting out of bed. Namiseom is a tiny island found near Chuncheon, the capital city of Gangwon Province. Amazingly, this can also be reached by riding the Seoul metro, for just a tad more than an hour. Less amazing, the train was packed, and we had to take turns sitting. 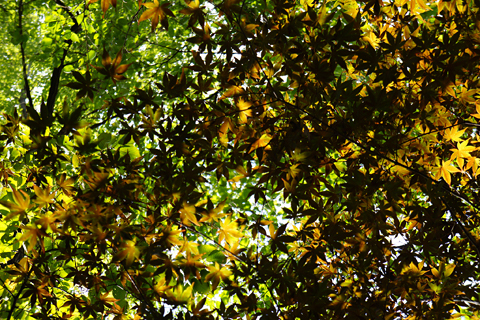 Namiseom advertises itself as a place for couples to savor romantic strolls amongst tall, celestially placed trees. In a different light, its history involves treason and an assumed gravesite being turned into an amusement park by a tourism company. This may explain the peculiar mix of sights and activities that fill the gorgeous plot, from pseudo-yurts to a flying fox that reaches from the mainland. Not only did we get to chase squirrels here, but chipmunks too! We never did find the ostriches, though. On the morning of our final day in Seoul we made our way slowly over to the food court in the Central City Shinsegae department store. This is not just any regular food court, it is, as far as we can tell, heaven on earth. The quality and range of food available is almost enough to make it worth working a retail job in one of the overpriced stores above. We had sushi, kebabs, fresh fruit juice, and cake. Then we returned home, satisfied with our five days full of inspiring places, flawless weather, and delicious food. You can view the rest of our photos right here.